12 days ago I mentioned we’d gotten the Safety 1st Grow and Go 3-in-1 Convertible Car Seat. I also mentioned that it was rattling. TL;DR: Their suggestion is a destroy the seat, ship them identifying parts, and be without a seat until they can process and ship me a new one. I shot Safety 1st customer support an email while I was at work asking if they had any particular preferred fixes to make this thing right/quiet and five days later I received a response that they couldn’t proceed without the model number and color and manufacture date. 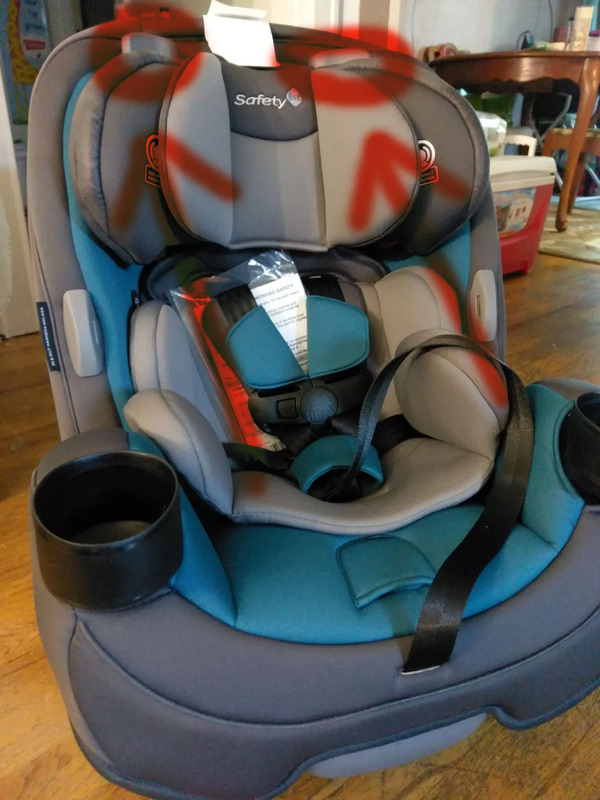 Got them the requested info on July 20th and five days later I’ve got a response that they want me to render the car seat unusable, send them several key parts they want ripped/cut out of the thing, and wait for them to process and ship me a new seat. Alternately I can give them a credit card and they can ship me one and reverse the charges when they receive the seat parts from the now-destroyed seat. My guess is that it would take about three days for the parts to get from here to there, another two to three days minimum for them to process it considering how slow things are otherwise, maybe four more days for shipping. So their suggestion is that I give up the car seat for another 10 days or so because their plastic handles have a slight amount of movement that I’ve temporarily fixed with a piece of paper jammed in each one. I checked at Costco and a different model of the same car seat has the same ability for the plastic handles to move, although they’re slightly tauter and don’t move as much. So yeah, rattle is just a little plastic movement that can be fixed by putting anything in or behind it, recomendation is I destroy the seat and be without it for several days. Not exactly world class customer service response times or suggestions. Better suggestions include sending me some stickers to place in the handles. A dab of elmer’s glue. Purchasing another car seat and returning this one to Amazon. Not to mention I’m also being asked to foot the bill to ship some parts off to them. If they fit in an envelope sure I’m out 50 cents or so, but I’m guessing if these parts render the seat unusable we’re talking the hooks or something that’s at least going to require an “if it fits, it ships” box at around $7. No. Lordy, times like this makes me happy that I can choose to ignore the pleas on the box, the requests of Customer Service, and return it where I bought it and let Safety 1st have to deal with an angry superpowered mega retailer with free returns on defective items instead of me having to foot the bill.